I arrived at Chatteris on what seemed a damp and grey day around an hour before my lesson to plan my flight to Boston as I was nearing the airfield I saw a C42 flying in the circuit and I was thinking to myself that the parachutists would not be jumping with such cloud cover, however as I turned into the track leading to the airfield I saw the twin Otter taking off closely followed by the main training C42. 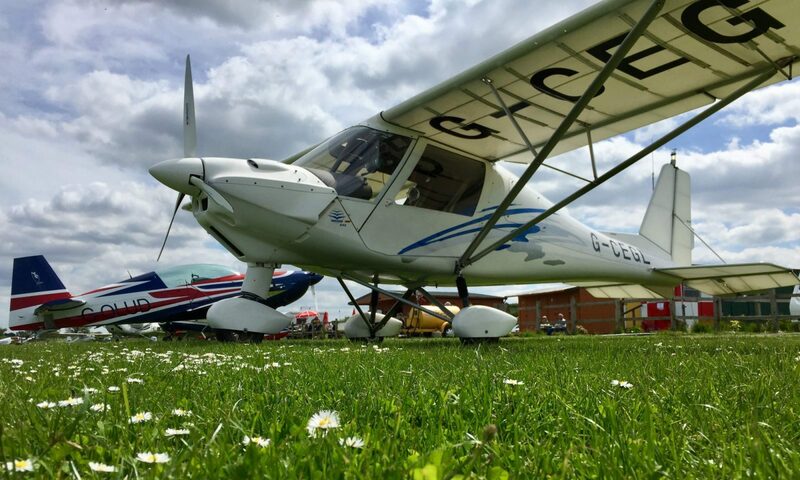 It often seems to have its own micro climate which allows for the microlight and the parachutists to go up while all-around the weather would not permit! When I left home it was layer cloud and raining but here it was scattered cloud and improving all the time. In the clubhouse I made myself a cup of tea and set about planning out my route to Boston, possibly my last dual navigation to Boston, all was going well and I drew out the triangles of velocities on the whiteboard and then checked my results on Skydemon light http://www.skydemonlight.com/ which is a great piece of software and I hope to buy and evaluate it on either on an Android or iPad once I have my license (so Lookout for a future review of flying with this!) most of my calculation worked out ok and with little head or tail wind I didn’t notice my fundamental error! In fairness to me it has been a while since I did the Navigation exam! So how do you draw the triangle of velocities? 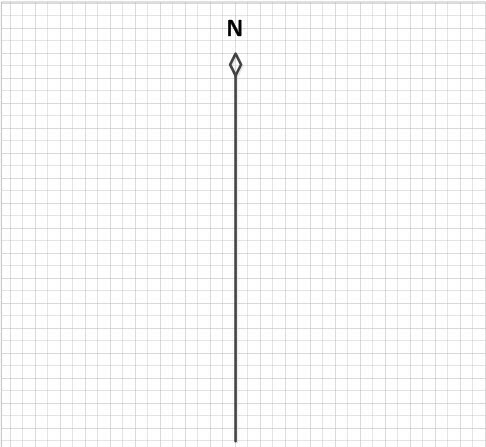 First Draw a vertical line to represent North with a diamond on the top to show it as a true north. Next plot the course you want to fly, for this draw a straight line from A to B on a map and read off the heading using a protractor. For Chatteris to Boston we want a heading or Trk(T) of 349° so next we draw this line on. Next go to the Met Office and get the spot wind for your altitude, Sunday this was 260/15 so we now need to draw this on. The wind is drawn across the north line e.g. above I marked off 260° on the left of the north and drew through N and out far enough to be able to mark off the wind speed on the wind line. Add 3 arrows to show it’s the wind line. 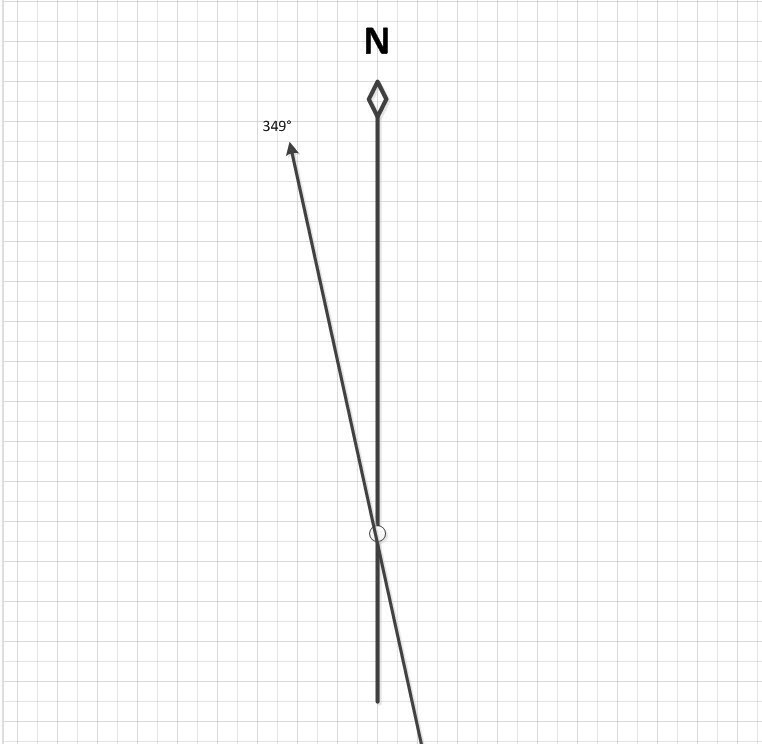 Take a ruler and mark the wind speed on the line from the north line, it doesn’t matter what scale you use mm, cm, your map ruler, whatever so long as all the measurement use the same scale. I used mm on this drawing for the blog. Next draw a line from 15mm along the wind line the length of the speed you will be flying and make the line intersect the Trk(T) line at that point . 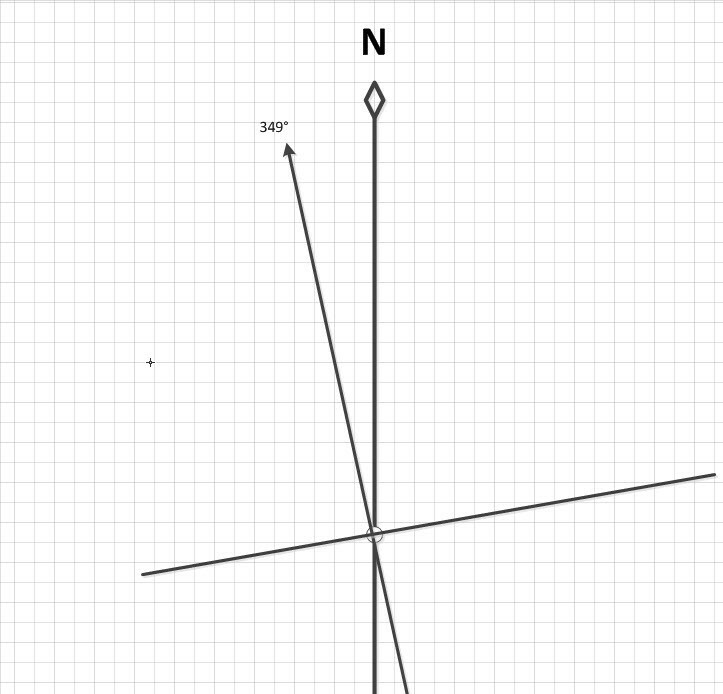 So below I have drawn from the 15mm mark a line that is 70mm (we fly at 70knts) where it joins the Trk(T) B – C below. If we now measure in mm A – C we get 67mm and this is by the magic of pythagoras theorem our Ground speed allowing for the wind 67 knots. 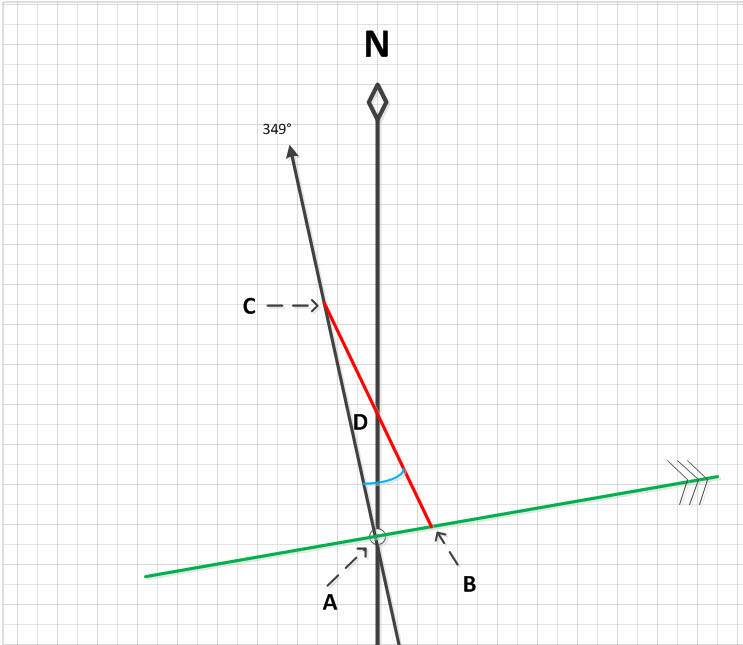 If we measure the angle of the line B – C from north we get 336° our heading true. So back to my flight planning well the fundamental error I made was I measured B – C as the ground speed even though I had drawn it 70 long for my airspeed!!! The flight to Boston went ok, I got a bit off course, but spotting Fenland airfield I re aligned and was ok from there. I soon spotted Boston and just to the left was the airfield. We landed OK (in fact for me it was quite a good landing!) and I got the teas in, while we were drinking our tea Mike was asked to do a check Flight which he agreed to do as no one was booked in after me. I stayed drinking tea and chatting to people. Sometime later we all watch Mike land and needless to say it was a perfect landing in every way. Once Mike was done we set off back to Chatteris and the navigation all went to plan we joined on a long final for runway 24 and again the landing was not bad. I refuelled the plane and cleaned the prop and some of the birds muck off the wings, as while we were out Stuart had booked the aeroplane and it was not good to hand it over in the state it was in. My next lesson in a couple of weeks’ time and weather allowing is going to be a solo to Boston and back!!! Previous PostPrevious Rain stops play and I’m not at Wimbledon! Next PostNext One step forward two steps back!